The countdown continues with only 4 days til the “It’s a MoM” Wrap Party. The party will start promptly at 6pm at The Boulder Museum of Contemporary Art. 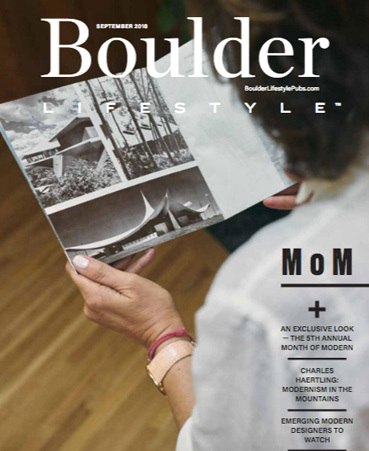 For just $35, you will be privy to an exclusive menu of delicious food and craft cocktails, and you will also get an inside look at what makes Boulder the hot bed of modern that it is. Not only will we have some of the Front Range’s most acclaimed names in modern and contemporary design attending the party, but we’ll have several incredible, local design firms showcasing their work throughout the museum. Oh, and if that wasn’t enough, there will fantastic music and a Todd Reed jewelry photo booth to boot! Tickets are still available, but selling quickly, so if you’re hanging around the Boulder area and looking for something awesome to do on Thursday, this could be just the thing for you. From the get go, Boulder’s Month of Modern has been on fire. We have sold out all of the events so far and received rave reviews from attendees. The “It’s a MoM” wrap party is sure to be the design event of the year.